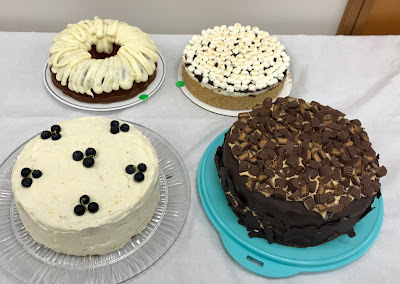 For several years, I have judged the annual Bubbe's Bake Off competition at Congregation Ahaveth Chesed's Jacksonville Jewish Food Festival. This year's, the seventh, the judging panel was particularly impressed with entries in the children's category. Both first- and second-place-winning young bakers found their recipes on line but they prepared the entries themselves; no adults are allowed in the kitchen during prep and baking. 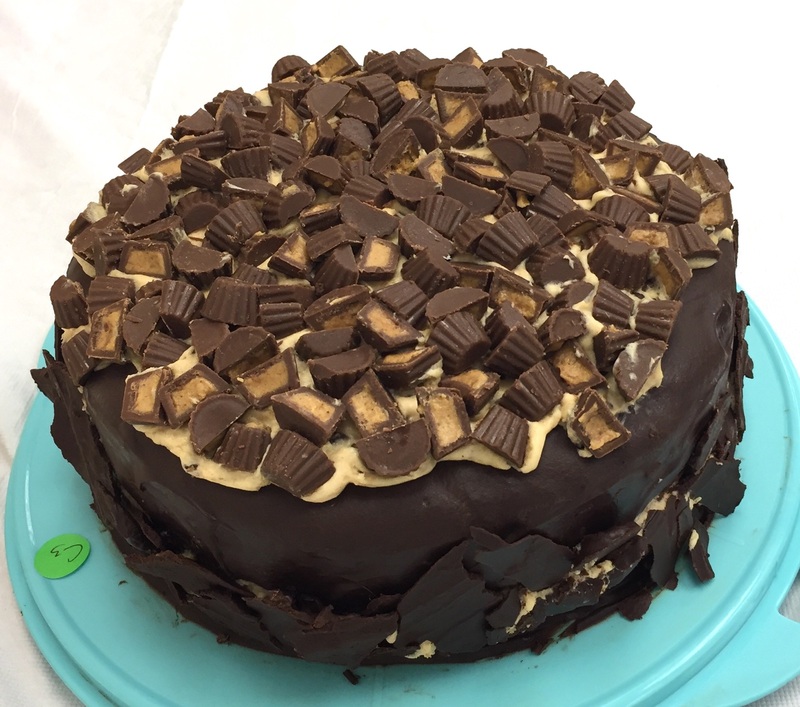 This, the second place winner by 13-year-old Ellie Pinnar, will be first in the hearts of chocolate and peanut butter lovers. Inspiration: "This peanut butter chocolate cake reminds me of my grandpa, who passed away in January of 2018. He LOVED all desserts, but the combo of chocolate and peanut butter was definitely in his top favorites. I got the inspiration from my dad. We were talking about cake flavors for the bake-off, and he reminded me of my grandpa and his favorite desserts. That's when it hit me to do this cake. Thanks, Daddy!" Preheat oven to 350 degrees. Spray two 9×2-inch round cake pans with non-stick cooking spray with flour. In a large mixing bowl, whisk together flour, sugar, cocoa, baking soda, and salt. In a large measuring cup, whisk together water, oil, vinegar, and vanilla. Add to dry ingredients and whisk just until combine. Divide batter between pans. Bake 35 to 40 minutes until a toothpick inserted in the center comes out clean. Cool cakes in the pans on a rack for 15 minutes, then invert them onto the rack. Leave cakes upside down (this flattens domed cakes) to cool completely. In a large mixing bowl, beat the cream until it forms soft peaks. In another large mixing bowl, beat cream cheese, peanut butter, and sugar until blended and smooth. Gently fold in whipped cream a little at a time. Fold in 1 cup Dove chocolates, finely chopped. Place half of the chocolate in a mixing bowl. Heat heavy cream on medium high heat until it comes to a boil. Remove from heat and immediately pour cream over chocolate and stir until chocolate is completely melted. Add remaining chocolate and stir until chocolate is completely melted. Cool until ganache is thickened but still thin enough to drip down the sides of the cake. When the cake layers are cool and ganache has thickened, evenly spread filling on bottom layer, carefully stack the second layer on top of filling. Spoon chocolate ganache on top of the cake, spreading to edges and letting the ganache drip down the sides. Refrigerate until ready to serve. Pile remaining coarsely chopped Dove chocolates on top. Here is the first place winner so you can taste for yourself. Second place will follow later. Preheat the oven to 350 degrees. Grease and lightly flour three 9x2-inch cake pans with nonstick spray. Set aside. Using a handheld or stand mixer with a paddle attachment, beat the butter on high until creamy -- about 1 minute. Add granulated and brown sugars and beat on medium-high speed until creamed, about 2-3 minutes. Add eggs and vanilla. Beat on medium speed until everything is completely combined, about 2 full minutes. Scrape down the sides and bottom of the bowl as needed. Set aside. In a large-sized bowl, toss together the flour, baking powder and salt. Slowly add the dry ingredients to the wet ingredients. Beat on low speed for 5 seconds, then add the milk, lemon zest, and lemon juice. Remove from the mixer and stir lightly until everything is just combined. Toss the blueberries in 1 tablespoon of flour and fold into the batter. Batter is extremely thick. Do not over-mix at any point. Over-mixing will lend a tough, dense textured crumb. Spoon batter evenly into 3 prepared cake pans. If only using 2 cake pans, bake time will be longer. Bake the three layers for about 21-26 minutes or until a toothpick inserted in the center comes out clean. Remove from the oven and allow to cool completely before frosting. Using a handheld or stand mixer with a paddle attachment, beat cream cheese and butter together on medium speed until no lumps remain, about 3 full minutes. Add confectioners' sugar, 1 tablespoon cream, vanilla extract, and salt with the mixer running on low. Increase to high speed and beat for 3 minutes. Add 1 more tablespoon of cream to thin out, if desired. Recipe is enough for a light frost. Using a large serrated knife, trim the tops off the cake layers to create a flat surface. Place 1 layer on your cake stand. Evenly cover the top with cream cheese frosting. Top with 2nd layer, more frosting, then the third layer. Top with frosting and spread around the sides. Top with blueberries or lemon garnish if desired. Refrigerate for at least 45 minutes before cutting, or the cake may fall apart as you cut. Tip: Prepare cakes and frosting 1 day in advance. Keep cakes at room temperature, covered tightly. Refrigerate prepared frosting in an airtight container until ready to use. 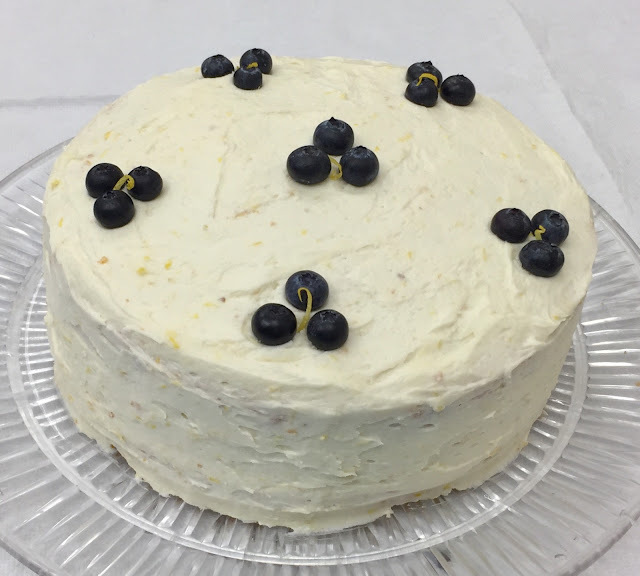 Frosted or unfrosted cakes may be frozen up to 2 months, thaw overnight in the refrigerator and bring to room temperature if desired before serving.